Caption slip reads: "Photographer: Gershon. Date: 1952-06-02. Reporter: Gershon. Assignment: Columbia Steel, Torrance. Final shutdown operations at Columbia Steel, Torrance. Photo with only one man is James Hansen, stirring molten metal to determine if lime is mixing properly. 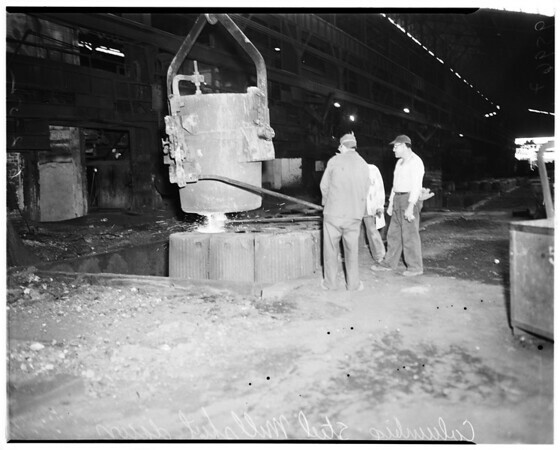 Other operation shows men 'teeming' or pouring ingots into molds. It takes eight hours to completely shut down hearths after order is given".